This year, UPP Arts conducted three different workshops in the science, art, and history departments at Alvarez High School. For the first time, Dave Evans was able to take his Advanced Placement Environmental Science students to explore a remediated site near Mashapaug Pond. Students identified the location of the Gorham slag remains and discussed its detrimental effects on the pond. This hands-on approach enhanced their learning experience by allowing them to apply classroom material within a real world context. 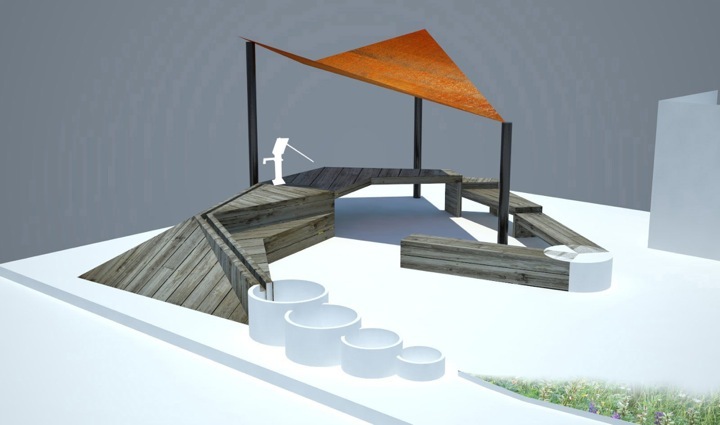 While observing the natural amphitheater created by the grassy slopes bordering the pond, Evans and his students imagined having their graduation on the banks of Mashapaug Pond. 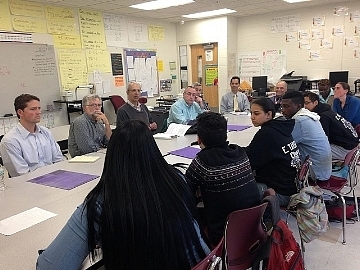 Working with Rhode Island poet laureate, Rick Benjamin, environmental science students at Alvarez High School also wrote a collective poem about the Mashapaug pond site using their knowledge on the environmental history of the site. 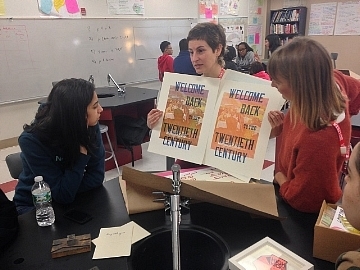 Afterwards, the students proceeded to transfer their poem into signs. 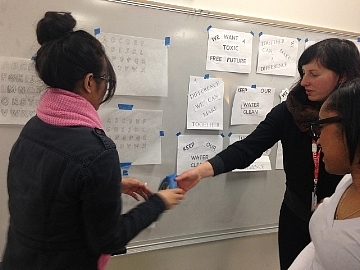 Kristina Brown, a teaching artist, taught sign painting as part of the project while each student hand-painted their line of the poem onto a 2' x 3' wooden board. 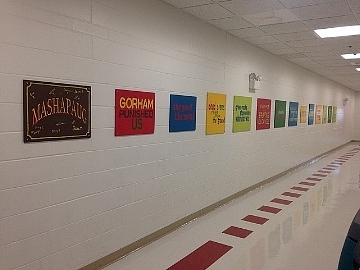 These signs now hang proudly in the first floor entrance hallway of the school. In the future, the students hope that their signage will be hung along the proposed walking trail built behind the school. Students also developed text for informational signs with Steph Yin, a Brown graduate in Environmental Studies and UPP intern, and learned how to design and print the signs for the walking trail thanks to teaching artists Jori Ketten, a graphic designer, and Kat Cummings, a printer at AS220. Students presented their projects at the quarterly Gorham Stakeholder's meeting to representatives from the Department of Environmental Management, Textron, the Providence Planning Department and the Reservoir Triangle neighborhood. The students spoke about the importance of being able to apply what they were learning in AP Environmental Science to the situation right out side the doors of the school. They were appreciative of having access to the remediated area around Mashapaug Cove. 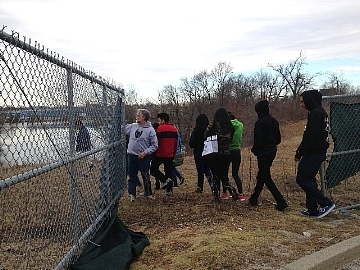 They recommended that students be introduced to the Pond earlier in their education at Alvarez so they could be more involved in advocating for its clean up. 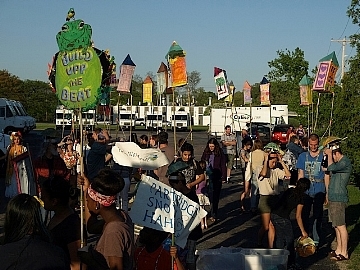 In the History department, Alvarez Current Affairs students worked with artist Dan Butterworth on constructing and choreographing shadow puppets that illustrated the history of the former West Elmwood neighborhood displaced by the Huntington Industrial Park in 1962. Their instructor, Tim Ahern, was able to explore his creative side with his students while teaching them valuable information about the residents of West Elmwood. This material was integrated into weekly quizzes and writing assignments. Their shadow puppet performance was a wonderful addition to the annual procession. 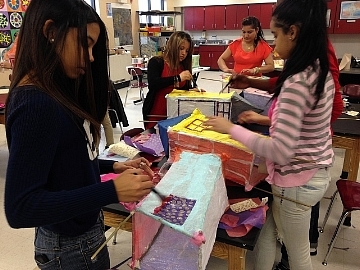 Students in the Art department made paper house lanterns to celebrate current and past neighborhoods around Mashapaug Pond. 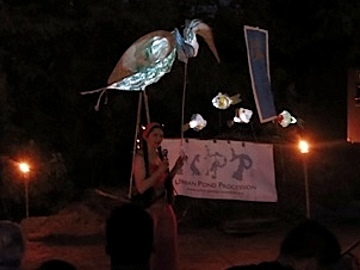 These creative lanterns lit the way during the procession and served as a beautiful visual tribute to the past, present, and future of the pond as well as its surrounding communities. 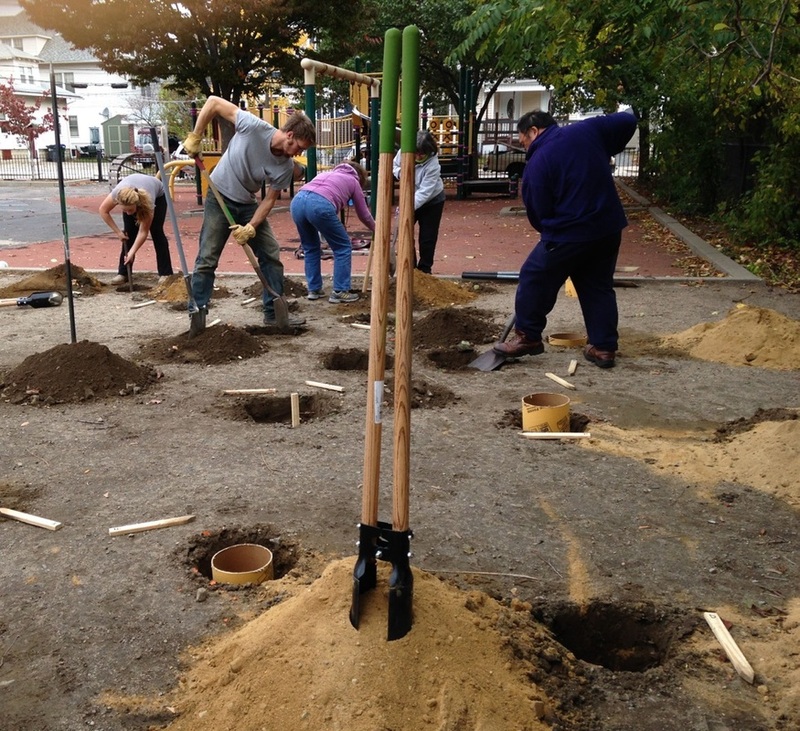 Oasis, originally known as the Dust Bowl Project, is an outdoor recreation space in the yard of Reservoir Avenue School, an elementary school just 5 blocks from Mashapaug Pond. It provides functional stormwater remediation for an environmentally sensitive site, while also serving as a teaching tool about the urban watershed. Building on the interactive play space design ideas that the 4th graders had come up with the previous year, Josh Lantzy and Jamie Topper, DownCity Design landscape architects, worked with 4th and 5th graders to conceive a design that could be built with volunteer help from parents and neighbors. 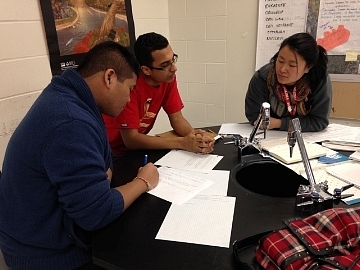 Fifteen students met in 8 after school sessions. They looked at pitcher plants for inspiration in designing the catchment for rainwater and incorporated the stage idea from the previous year. 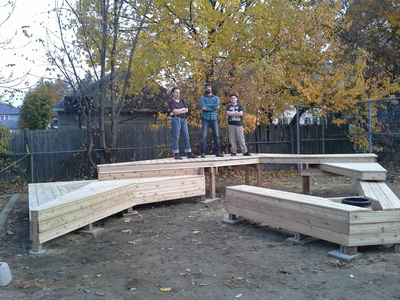 Phase 1 was completed in the fall with the help of volunteers over three days. 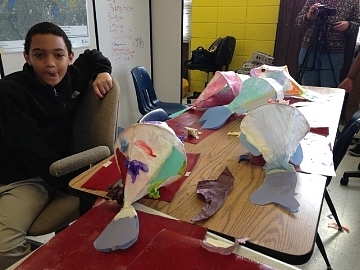 Meanwhile, teaching artist Lisa Abbatomarco worked with a group of 3rd graders from Reservoir Elementary to create individual turtle lanterns. 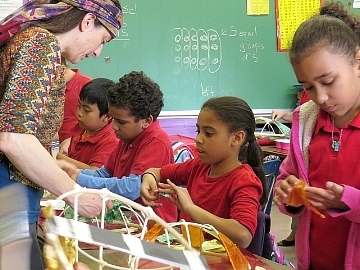 The children first had to construct the basic form with reed, a common material used in basket making. 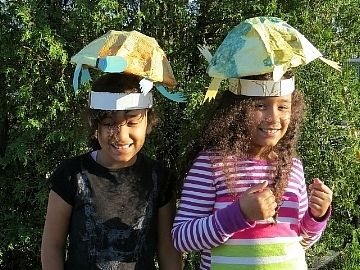 They then covered the "shell" with handmade papers and added a head, legs and a tail. Worn like crowns on their own heads, the lanterns were showcased during the Procession. 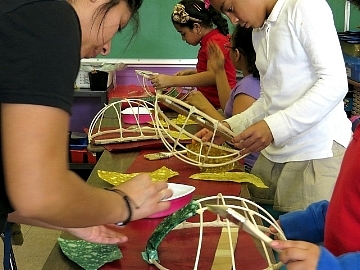 UPP worked with students at West End Community Center to construct beautiful fish and bottle lanterns for the annual procession. After the arts and crafts, the children also learned facts on storm-drain run-off, which culminated in a spectacular presentation for the public. "The children had an awesome time in the parade holding their fish and dancing."